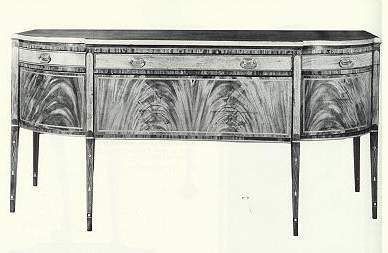 16 Fine Hepplewhite inlaid mahogany "D" shaped sideboard, of unusual length and design. The top drawers, the top edge and the stiles fronted with satinwood veneer; the legs inlaid with black and white circle, loops ending in a bellflower with the circle repeated on the cuffs, with beautiful mellow light brown patina and original octagonal brasses. The section below the center drawer drops down on quadrants to form a serving board. Baltimore, Maryland, circa 1780-1800. 84 1/2' long, 41 1/4" high, 28 3/4 " deep. Photo Credit: American Antiques from Israel Sack Collection - Highland House Publishers Inc., Volume __, Plate 4810.